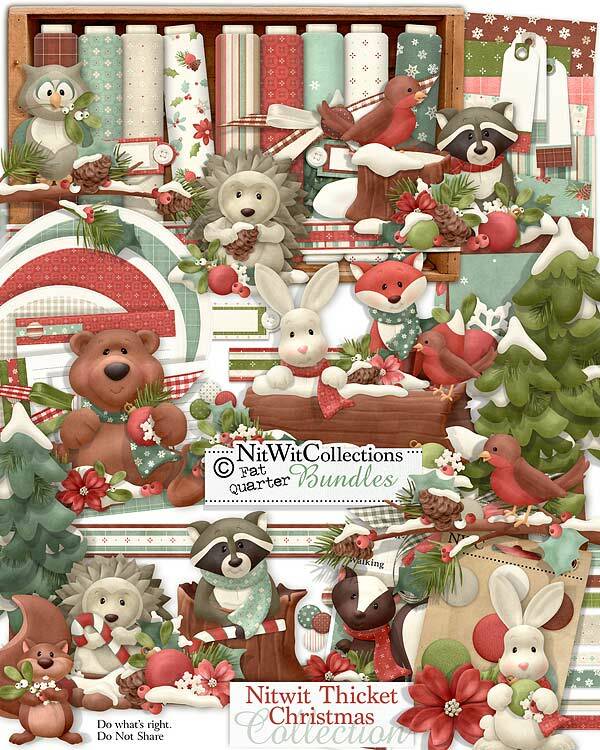 FQB "Nitwit Thicket Christmas" Collection was a much asked for digital kit. We listened, and here it is!! Our critter characters are immersed in their Christmas poses and activities for you to bring them to your digital scrapbooking layouts and cards! Created in traditional Christmas colours this digital kit is sure to be a hit in your Christmas creations. With many of them already bedecked with Christmas embellishments your toughest choice is going to be who you want to use first....is it the fox, the hedgehog, or the bunny?? But don't forget about the bear...it makes him feel a little left out! 1 Border in red, green and cream....can you get more traditional than that? 7 Brads with patterned centres...you choose the ones that are right for your ideas! 1 Cluster of softer coloured elements all perfectly arranged for you! 3 Journal strips - blank, for you to write in your names, dates, titles, etc. 1 Owl...hey, it's daytime and he's awake!! 1 Raccoon waiting to place his Christmas ball on the tree....just make sure he doesn't make the tree his new home! 1 Squirrel with a holly branch...you didn't think he'd share his nuts with you, did you?! 1 Raccoon inside his hollow tree vignette....but don't try to take his candycane!